MAXIMUS MPX is an ex-proof PTZ camera that offers a superior image quality and an exceptional precision even in poorly lighted environments. 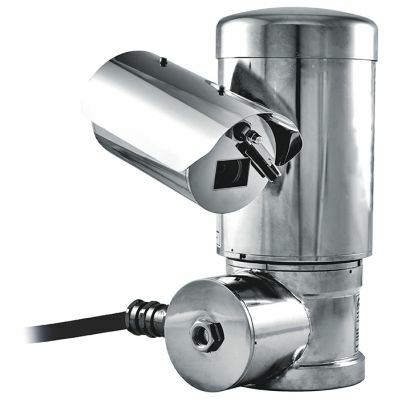 This ex camera is ideal for effective video surveillance and process control in harsh settings where the presence of gases or flammable dust can create a potentially explosive environment. A reality often found in the oil and gas industries or marine and industrial sectors. The area is always monitored, thanks to the speed and detection accuracy of the target. Made of AISI316L stainless steel, which is excellently resistant to UV rays, salt mist and air pollution. All models are available in Analogue or IP version. The flexible operator control of pan/tilt/zoom functions allows the video transmission over the local area network (LAN) or over the Internet with the H.264/AVC compression, compatible with ONVIF Profile S. The Videotec's PTZ ASSISTANT plug-in software supports any VMS with the control of all special functions such as wiper and washer pump. The WASEX washer kit, with tank and pump controlled by an ex-proof solenoid valve, allows flawless and maintenance-free cleaning of the front glass.